Want to dig gold & silver jewelry, coins and other metal in the ground? Try our TIANXUN Metal Detector. 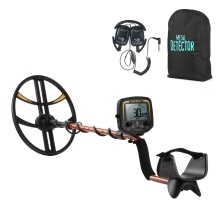 With this powerful and extra large metal detector, you can hunt for coins, relics, jewelry, gold and silver everywhere. It is also widely used in detecting aluminum, copper and rare metals and anywhere that hidden metal needs to be detected. Widely Use – Perfect for finding metal objects and anywhere that hidden metal needs to be detected. Designed to search gold & silver jewelry, coins and other metal in the ground. Special Function – With Pinpoint button for accurate detecting & 3 tones for three different metal categories. LCD Analogue Display & Audio and indicate the probable type of metal being detected with low battery indicator. Unwanted Target Elimination – You can set the detector not to respond to some objects for gold exploration. Identify the metal in night or dark outside. Adjustable Height of Metal Detector – Adjust the detector’s length for comfortable use. Easy to adjust and operate your detector comfortably. Headphone Jack and Adjustable Volume Control – Provided for headphone connection. Both stereo or mono headphone can be used. Adjust the output volume of the loud speaker or headphone.